Despite being well received, the Jaybird X2 wireless earbuds caught some heat for not being significantly different from the first gen version. The new Jaybird Freedom (technically the Freedom F5) wireless earbuds are a different animal entirely. Jaybird has slimmed down the size of the earbuds to make them more comfortable, but says it hasn't sacrificed sound quality. They do look almost impossibly small. I've been taking these earbuds for a spin to see if they are worth the admittedly high $200 price tag. One of the ways a premium pair of earbuds can make you feel like you've gotten your money's worth it to cram as much stuff as possible in the package. The Jaybird Freedoms are no exception. You get three different sizes of both silicone and foam ear-tips, three different sized silicone ear fins, a few clips/cable organizers, a USB cable, and a charging bracket/battery. The in-line remote has all the usual stuff, a microphone, play/pause control, and forward/back buttons. I do wish the middle button felt more different so it was easier to identify by touch. Like any Bluetooth device, the Freedom earbuds will pair with your phone in a few seconds once you get them both into pairing mode. Just hold the center remote button for a few seconds to turn on and enter pair mode. 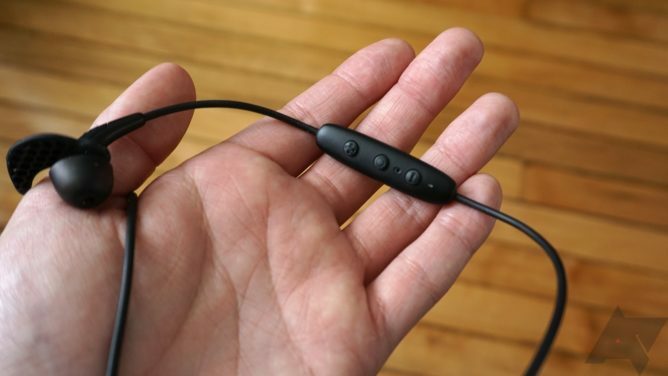 You will be greeted by a female voice this and every time when using the Jaybird Freedom earbuds. She tells you when the power has come on, what your battery level is, and when you're connected. All of this comes with jazzy background music. The new Jaybird voice is... I don't really know how to feel about it. This woman is so, so excited about my battery level, and I find it mildly annoying. Still, I do like knowing my battery level. I've paired the Jaybirds with a few devices, all of which worked as expected. You can just pair them the old-fashioned way, but Jaybird also has a new app specifically for the Freedoms. It's the Jaybird MySound app, and it's taking a beating in the Play Store reviews because it's only for the new Jaybird Freedom. That's not exactly clear unless you read the description (we all know people don't do that). The app includes EQ settings for the earbuds, and it can be used to manage your connection and check the battery level. There are a ton of presets from sports figures, some of which don't sound very good. So, it's an EQ—big deal, right? The app isn't actually where the EQ is coming from while you're listening to music. It simply loads the preset to the earbuds so you'll get the same tuning no matter what device you use, and without worrying about the app. 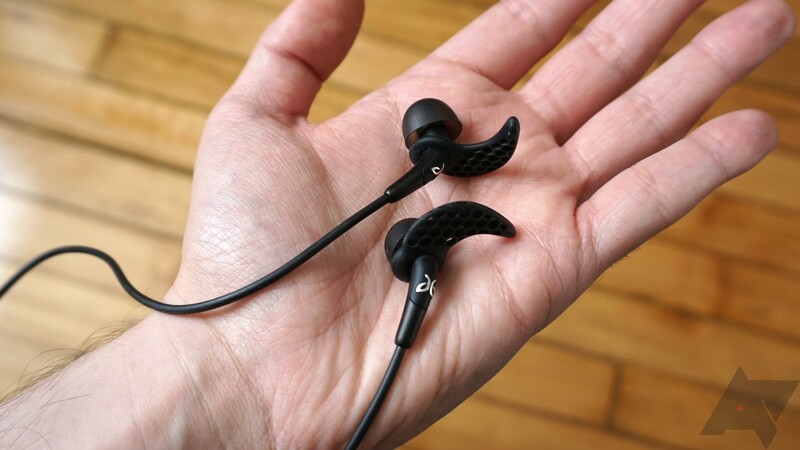 Jaybird shrunk the Freedom earbuds to an insane level (see below). They're incredibly light and insubstantial in the ear, as if they could almost disappear in my ear canal. Try explaining that one at the ER—the earbuds are too small and I got carried away, doctor. But in seriousness, I'm really happy with the overall design. The seal and fit are great, once you find the tips that suit you best. The Freedoms are great for wearing while lying down or are otherwise stationary. What about when you're not stationary? Let's go over some basics of the design first. So tiny without the silicone bits. Jaybird slimmed down the drivers in the earbuds, but I suspect most of the reduction in size is from moving the battery from the earbud body to the in-line remote. So, the earbuds can almost disappear into your head, but the remote is noticeably heavier than it was on past Jaybird headsets, which changes the balance slightly. 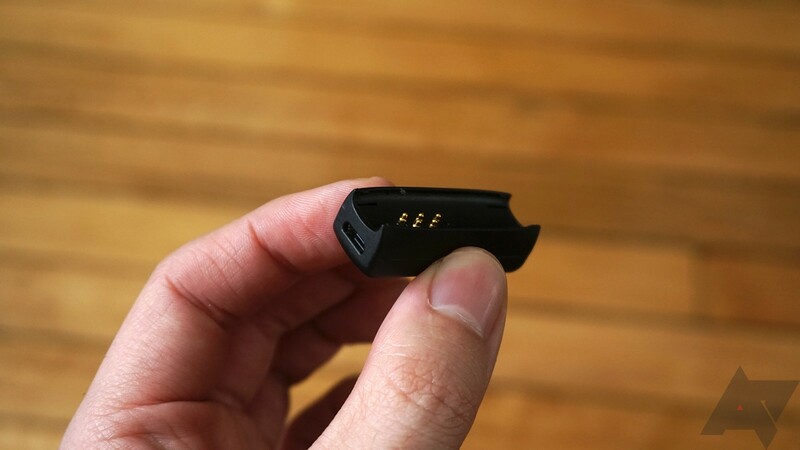 To charge it, you have a small clip with a microUSB port that itself is a battery. You get four hours of juice in the headset and another four in the clip. That's an odd, slightly disingenuous way to claim 8 hours of battery life. So about the fit, I always use the ear fins to keep the earbuds firmly stuck in my ears. With the right sizing, they stay in place well. I wore the Jaybirds at the gym several times, and I never lost an earbud. I didn't even have to adjust them much. However, there's a slight tug on the right side caused by the remote with its built-in battery (the cable shorteners lessen this to a degree). Without the fins, the Freedoms don't stay put as well as I'd like, certainly not well enough for use at the gym. They won't just fall out of your ear every ten seconds, but they do move around. 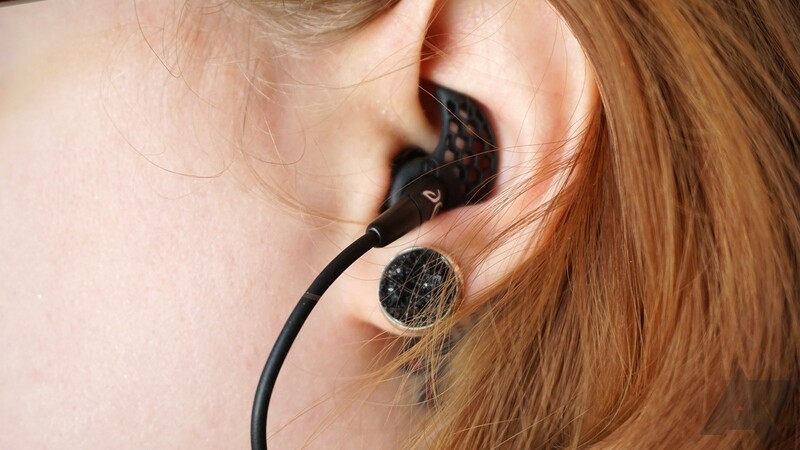 You can also wear them with the cord run over top of your ear. I don't personally find this comfortable, but it does mitigate the balance issue. The bottom line here is use the fins if you can. Artem reports this is a complete deal breaker for him—he doesn't like the Freedoms, but he's a huge fan of the X2. She asked what color the earbuds were so she could choose appropriate earrings. 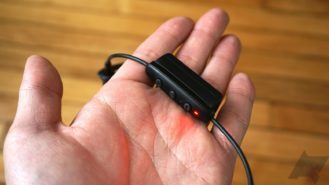 As for that battery pack, Jaybird says that you can connect it to the Freedoms while you're wearing them to recharge. That means you essentially never have to plug them in—just recharge the battery pack repeatedly and use it to juice up the buds. That makes the right earbud feel even heavier and distracting. Even with the fins fitted properly, the right side tends to slowly migrate out of my ear if I'm moving around with the battery pack attached. With the smaller 6mm drivers, I was concerned that sound quality would suffer compared to similar products. That doesn't appear to be an issue—I'm overall very pleased with how the Freedom buds sound. The default EQ is a bit flat for my taste, but saving a new preset to the earbuds fixes that. With any of the included options, the mids and highs are very clean. Songs sound crisp even with the volume cranked to irresponsible levels. Bass is always a little iffy with earbuds, but the Freedoms manage to hit the low notes without distortion. My only qualm is that even with the EQ tweaked, there's not a lot of power behind the lows. You'd have to listen to a song with a ton of bass to really be bothered by this, though. As mentioned above, Jaybird claims you can get 4 hours from the earbuds without the battery/charger attached. I've been getting someplace in that ballpark, or maybe a bit less. If you have Bluetooth earbuds in for a large portion of the day, these might not be right for you. You'll be recharging at least once. I suppose you can use the battery pack to get more juice on the go, but as I said, that's not terribly comfortable. Are you going to spend $200 on Bluetooth earbuds? The answer for most people is "definitely not." I can understand that; it's a lot to spend on an accessory. Hell, you can get a decent phone for that much. If you care about sound quality and need wireless earbuds aimed at fitness, you might want to consider the Jaybird Freedom earbuds. 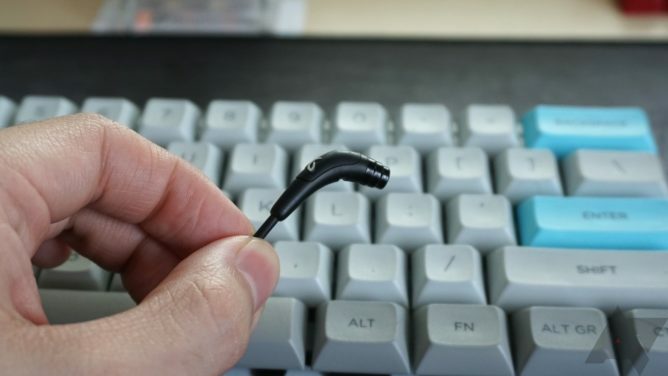 The small, light frame stays in the ear well (most of the time), and the sound is great. Some people might prefer the older (and cheaper) X2 earbuds. The upgrade over the X2 is not significant, but I feel like the Freedoms are a bit more comfortable. Not everyone will agree; every ear is different. The Jaybird Freedom wireless earbuds are available at Best Buy and direct from Jaybird if you want to give them a shot.